This unit for fluidslide conveying systems is well-accepted by engineers and operators worldwide. The sectional drawing shows the principle convincing by its ingenuity. Dischargers and branching chutes are indispensable in fluidslide conveying systems. 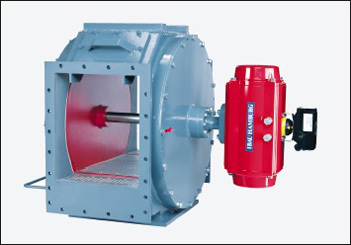 Even the best flap-type dischargers available up to now are often only tight at the beginning of operation. Incrustations and foreign bodies can cause trouble by causing leaks. 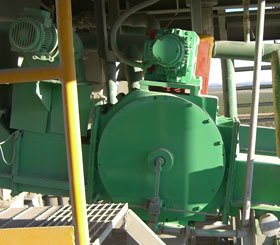 The IBAU Roller-type discharger is different, being as tight as an IBAU Flow-control gate. Many parts are the same as those used in flow-control gates. The bottom is permanently aerated. Maintenance is reduced to the very minimum.